So... I know that I already have 2 sewing machines (one is just to look at) and the other is for every day use. THIS ONE though... the "new" one.. is for industrial strength projects!! Like resewing our sails this summer and sewing through canvas and leather and all kinds of new fun things I've never even been able to play with because my Kenmore can't handle it. I bought this on Ebay from a shop in Canada. 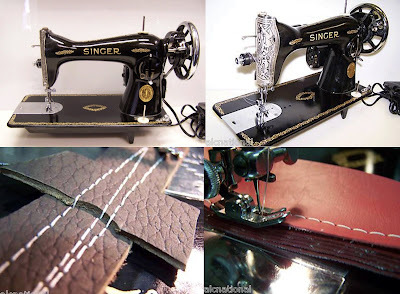 It is a refurbished 15-88 1949 Singer Sewing Machine. And it is MAGNIFICENT! I'm pretty sure you will know where to find me this weekend... at my house sewing everything I can find together. Check it out! Shes beaut, a classic work horse for sure! hey tamara, your comment totally made my day! thanks for coming over and I'm so happy you found your way through my archives. I am so inspired by all your sewing skills! seriously makes me want to start work on learning how to use my industrial Elna machine (which has sat quiet since I bought it off ebay). really fun to find a new blog + etsy shop to follow.